Hello friends, today I am going to post the next lecture of Proteus Tutorial. I am receiving quite a positive response about this Proteus tutorial. In the previous post, we have seen How to use Virtual Terminal in Proteus and today I am going to explain How to use Oscilloscope in Proteus ISIS. This oscilloscope is just the same which you have seen in your electronic or electrical labs. Oscilloscope is basically used to monitor signals or waveforms. Particularly when you are not much aware of the circuit and you need a little debugging then you use oscilloscope. In oscilloscopes, we can visualize the electrical properties of waveforms, like we can check whats the frequency of electrical signal, what’s its voltage or current. Digital oscilloscopes have vast range of features in it like RMS value calculation etc. So, in short when you want to visualize or research your available signal then oscilloscope is the first and right most option for you. In today’s tutorial, first of all, I am gonna design a simple Pure sine wave circuit and then we will visualize its properties using oscilloscope in Proteus ISIS. 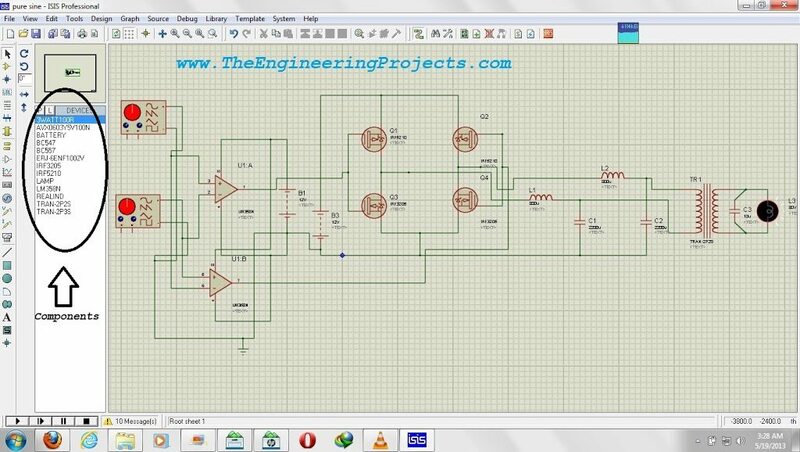 First of all, design a circuit as shown in the below figure. 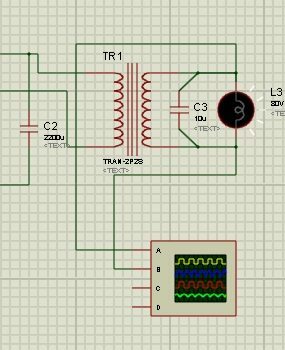 This circuit is a simple pure sine wave inverter which is inverting the DC Signal into AC signal. I have also encircled the components so first of all, find these components in the Proteus database and then design the circuit as shown in the figure. (Right click on the image and then open it in new tab to get the clear view). When I was designing my Pure Sine Wave Inverter Simulation in Proteus then I have to use oscilloscope quite a lot. How to use Oscilloscope in Proteus ISIS ??? Now in order to add the oscilloscope in the circuit, first click on the Virtual Instruments Mode as shown in the below figure. In that mode the first option will be the Oscilloscope which I highlighted as Click # 2 in the below figure. 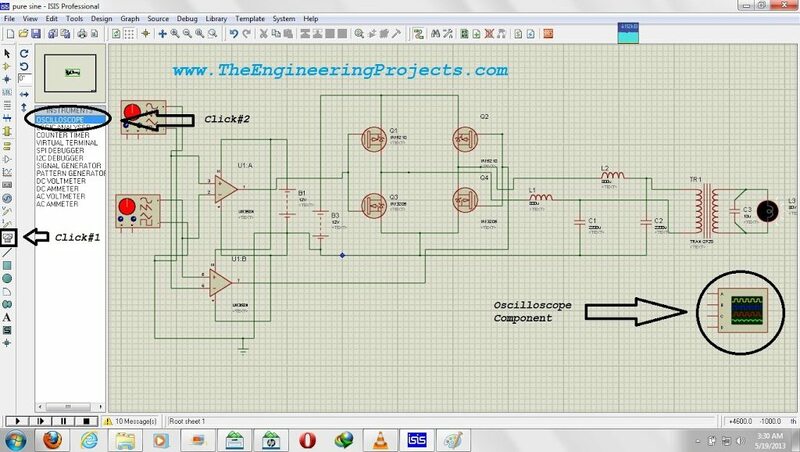 Now drag that oscilloscope and place it in the workspace, as you can see below this component has total four legs means you can view total four different types of signals using this oscilloscope and cal also compare them, if you need to. Now what I want to check in my circuit is, whether I am getting the pure sine wave at the output or not. So in order to check that I have attached the two ends of the bulb which is acting as a load with the two probes of oscilloscope i.e A & B as shown in the below figure. Now in order to monitor the oscilloscope, run / play the Proteus circuit and then double click on the oscilloscope and a new window will open up as shown in the below figure. As you can see in the below image there are total two curves are showing i.e. Channel A & B. Now, if you check the right side of the above figure, you can see there are total four channels, each channel represent each probe. Like we have attached our curves with A & B now I can change settings of A & B channel and the output curves will be changed. Play with this tool and you will how easy it is to use. 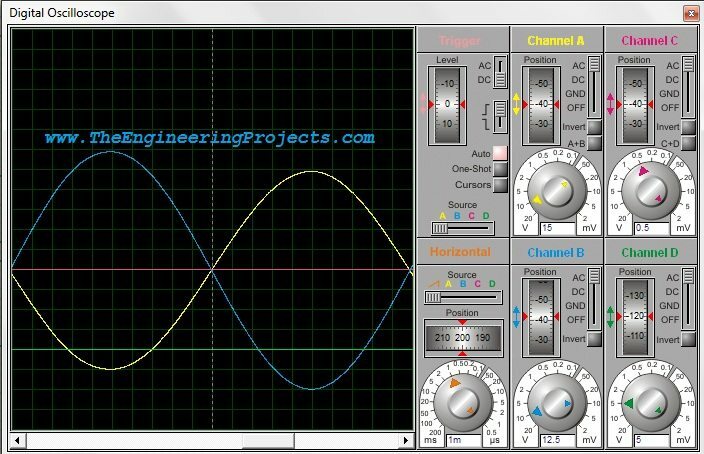 Change the position of circular know and the amplitude unit will be changed, then change the linear know of each channel and the dc offset will be added in the curve. This Proteus file has been emailed to all the subscribed members, if someone needs it kindly Subscribe to our Newsletter and it will be emailed to you. Here’s the complete video tutorial of above discussion, better for understanding. Yeah it is, check the right side bar , just below google search engine. Thanks for liking our blog. I would be grateful that u send me Proteus file of this project. Could you please tell me what the function of the button “Source” in the section “Horizontal” is? Is there a complete user manual for the ISIS 7.7 or higher?